Of the many political demonstrations taking place in Orange County, a recent Main Beach protest targeted Rep. Dana Rohrabacher. Aaron McCall, an organizer of the street action who was handing out scripts of chants and songs, called the turn out “inspiring” given the short notice. He’s a member of the IOC 48, made up of residents of the 48th Congressional District, which spans coastal Orange County from Seal Beach to Laguna Beach and is represented by Rohrabacher. They follow a community organizing strategy mapped out in the Indivisible Guide, intended to pressure elected officials to be responsive to constituents. McCall, of Newport Beach, said a few Republicans participate. As a freelance marketer with a flexible work schedule, he joined the group in February after hearing about the movement on a news show. Sara Lowell, of Laguna Beach, also helped organize the May 19 march. 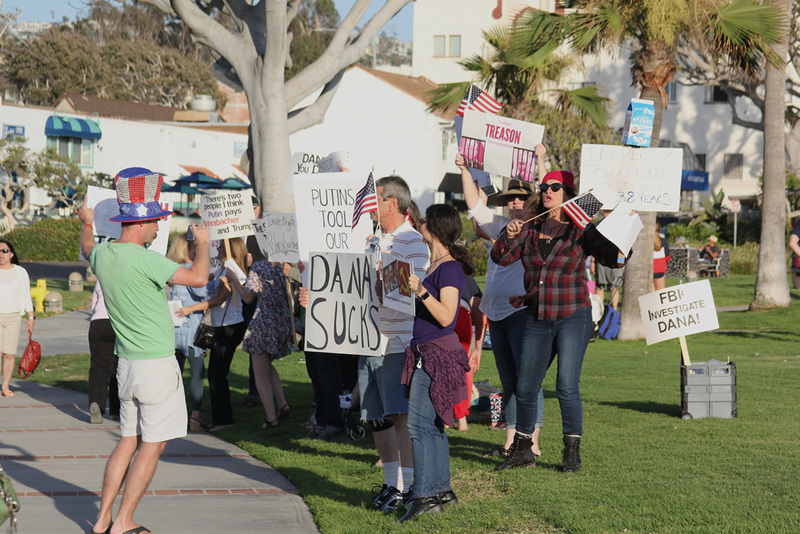 In recent months, she’s regularly attended Tuesday rallies outside Rohrabacher’s office seeking a town hall meeting. It hasn’t happened yet. Lowell works a fulltime job at a Laguna-based foundation working on social benefits and environmental protections and is raising a young son with her husband. He helps her find time for volunteer activities. Lowell said the group will also start service events beginning with a cleanup with the Surfrider Foundation on Saturday, June 3, at Prospect Street and Oceanfront Boulevard in Newport Beach. The IOC 48’s website includes scripts and phone numbers of representatives, a tool to track legislators’ votes, lists of activism opportunities and a shortcut for sending faxes to a congressional representative by text. Rohrabacher’s website offers assistance with getting federal grants, ordering flags, procuring internships, planning visits to Washington D.C. and getting military academy nominations. Staunton said constituents cannot register for the telephone town halls. “It’s not done like that,” she said. The phone numbers are gleaned from voter registration cards and other public records, such as property tax bills, she said. Outside companies, like telephonetownhallmeeting.com and others organize the meetings. Congressmen Lou Correa of Santa Ana and Scott Peters of San Diego also use the telephone town hall meeting model. A recent telephonic town hall reached 3,500 South County constituents and allowed for 50 questions to be addressed, Staunton said, adding that the conversations typically take place in the evening and last for two hours. In March, local Harley Rouda announced his intent to unseat Rohrabacher, who faces re-election in 2018. Rouda, a resident of Emerald Bay and father of four adult children, serves on boards or acts as an advisor to companies involved in real estate, retail and other industries. Rouda’s energetic candidacy, in part supported by his own funds, calls for the inquiry into Russian influence in the U.S. election. Though Rohrabacher won re-election in 2016 with a 16.6 percent margin, Fran Sdao chair of the Democratic Party of Orange County, seems impressed by Rouda’s campaign. “Harley has a very aggressive, experienced campaign team and they are doing a good job getting him out there quite a bit,” she said. Los Angeles political consultant Dave Jacobson, hired by the Rouda campaign, describes an “unprecedented amount of passion, energy and electricity on the ground in Orange County.” The campaign also includes a polling team, community outreach and fundraising consultants and two companies to handle communications. The candidate has picked up endorsements from unions, political figures and support from local voters.